Like any developing sector, there have been challenges, and the progress of the industry has faced criticism as issues of the environment are entwined in the culture of B.C. Through innovation and adaptation, several important gains have been made over the past decade in specific areas of importance, as the industry has become more mature and technically sophisticated. Focusing on three core pillars of sustainability – environmental, social and economic – the BC Salmon Farmers Association (BCSFA) released its inaugural Sustainability Progress Report on October 27, 2015 at the Global Aquaculture Alliance (GAA) GOAL conference, held at the Four Seasons Hotel in Vancouver, B.C. The use antibiotics in the B.C. salmon farming industry has decreased 7-fold over the past decade, currently sitting at approximately 50 grams of antibiotic prescribed per tonne of production. The salmon farming industry in B.C. has also been recognized for its protocol to only use medicine to treat fish with existing health issues, and only through the prescription of a veterinarian. On sea lice management, companies take a number of proactive measures to manage sea lice numbers and mitigate potential issues. The report presents the average number of salmon lice (Lepeophtheirus salmonis) on salmon farms over the past 10 years and discusses the proactive measures taken to manage sea lice for the health of both farm-raised and wild fish. Salmon feeds used in B.C. contain less than 18% marine-based products (fishmeal and oil). Significant improvements made by feed development companies to replace marine oil and protein sources with plant and animal sources. 78% of the salmon raised in B.C. is done so in partnership with First Nations. Collectively, salmon farming companies in B.C. currently have 19 economic and social partnerships with First Nations, and are working towards many more. In 2013, about $600,000 was donated by salmon farming companies to community organizations and causes. Salmon farming contributes about 5,000 jobs and over $1.1-billion to the B.C. economy every year. The intent of the BCSFA’s Sustainability Progress Report is to show the industry’s commitment and progress, as well as the industry’s on-going dedication to furthering the goals of creating a sustainable future for B.C.’s oceans and coastal communities. As indicated by Dunn, this is a progressive journey that will continue through shared values of openness and transparency. Launching the report at the GOAL conference provided an international audience for us share our progress, and also get feedback from others in the aquaculture industry. The GAA GOAL conference brought 400 aquaculture industry leaders, as well as retail and foodservice professionals, academia, representatives of NGO’s and governments from around the world to Canada for the first time. In continuing with the theme of consumer education, the BCSFA intends to provide updates to this report on an annual basis. 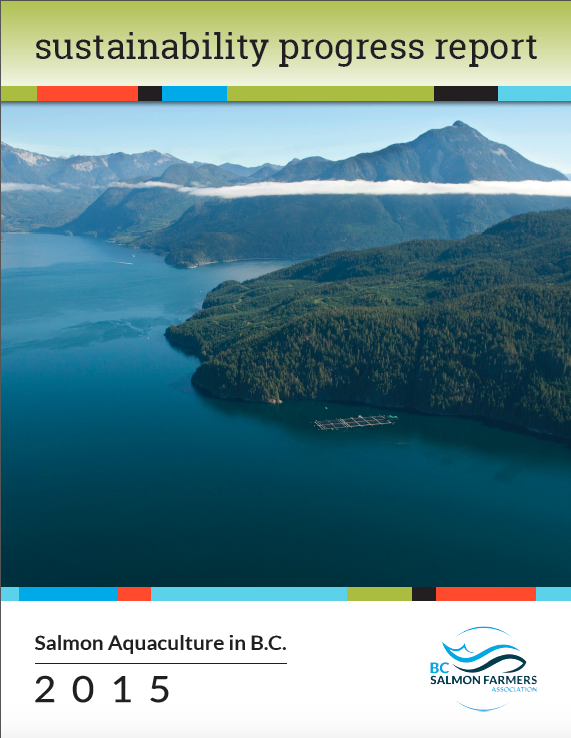 The full report for 2015 is available online at bcsalmonfarmers.ca.